The following periodical appears in Anarchy Archives thanks to FLA, the Federacion Libertaria Argentina and their project, Biblioteca-Archivo de Estudios Libertarios. There is no time or conditions to make a stop on the road, and rethink, reflect, take a breath and orientation as in the beautiful days when we were allowed even a glimpse moment of leisure, of laxity, of calm. You have to talk in full swing - workers in industry or in fields, soldiers in war - without stopping or losing sight of the ultimate goal that keeps us in tension for two years. Whatever our observations, from peer to peer, are not of a nature as to leave aside tool or gun, meditate and assimilate or discard according to the usual process of acceptance or rejection of an opinion, an idea, a given direction. These observations are made at the hearing of those working and struggling for,while intensifying their efforts, each other, with the eyes of the mind, since the great ideal that animates us. Because if we win the war and lose as a determined social movement, the Spanish people, which we have been in the last three quarters of a century of light and spring of all higher life would have no reason to rejoice. 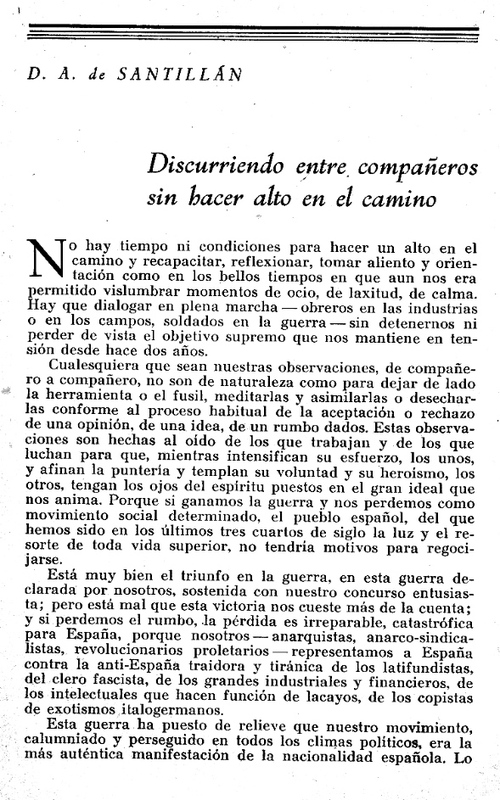 It is very good to triumph in the war, in this war declared by us,sustained by our enthusiastic competition, but wrong that this victory cost us more than the current, and if we lose our way, the loss is irreparable, catastrophic for Spain, because we --anarchists, anarcho-syndicalists, revolutionary proletarians-- represent Spain against the anti-Spain traitor and tyrant of the landowners, the fascist clergy, the great industrialists and financiers, intellectuals who make function of lackeys, of the copyists of italigerman exoticism. This war has shown that our movement, slandered and persecuted in all political climates, was the most authentic manifestation of Spanish nationality.